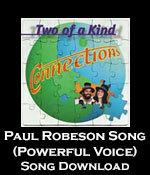 Paul Robeson was a true “Renaissance Man” with impressive talents in music, sports, drama, and political/social change. He was a great African-American hero. Unfortunately, in the 1950’s Paul Robeson was persecuted for his political views.